Some crap I made a long time ago and some crap I made a very long time ago. Probably nothing that you could run. The museum of old. 1994 - 2d-scroller drawing bitmaps using a tile-map. The scrolling is done by using a virtual screen (bigger than visible) and moving the viewport pointer. New tiles are drawn a bit ahead in the forward directions (could be 2 if diagonal), so we can scroll forever. This utilizes a cute features which was sadly not available at the time on all VGA cards; the graphics memory wrapped, so we never had to re-draw the full screen ever. Tools used: tasm (borland turbo assembler), qedit, dos, vga card. 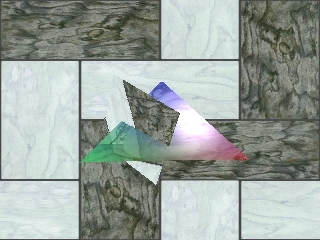 1996 All-in-one 3d code showoff written in C mixed with assembly. 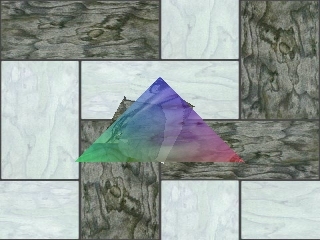 This is graphics I made before learning OpenGL. So it's all drawn pixel by pixel and 3d-math calculated by my own code. The background is just a 2d-bitmap drawn instead of clearing the screen. 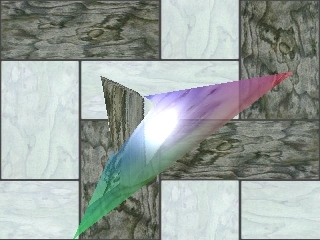 The 2 triangles rotate, one is environment-mapped and the other is semi-transparent with a gradiant between each vertex (coloured red/green/blue) plus a semi-transparent texture map of some lady's face. The light is phong-shading calculated per-pixel. My poor 486dx4 120mhz PC had to struggle with one sqrt per pixel. Enabling the phong light reduced the framerate from some 20fps to 2fps iirc. Tools used: djgpp (gcc for dos), emacs, dos, some svga card capable of 24bpp.